Own a small piece of Sunset history and raise money for your Alumni Association at the same time! Purchase an authentic brick from the original school smokestack built in 1925. Each brick is $54.83 which includes tax and shipping/handling. 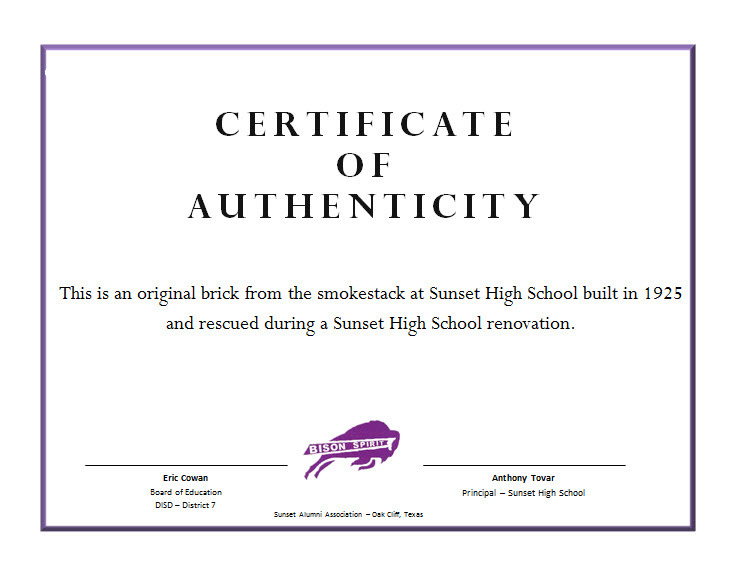 Each brick comes with a Certificate of Authenticity and is signed by the former Principal, Anthony Tovar and Eric Cowan, former DISD District 7 trustee. All proceeds go toward the Alumni Association annual grants. have your brick and certificate mailed to you. Click on the form link to the right and download, complete the form and mail with your check or money order.